What was interesting about it was that it identified itself as "Seattle DOS". Now, although this is clearly for an IBM PC compatible, I wondered if this was in any way related to Seattle Computer Products. 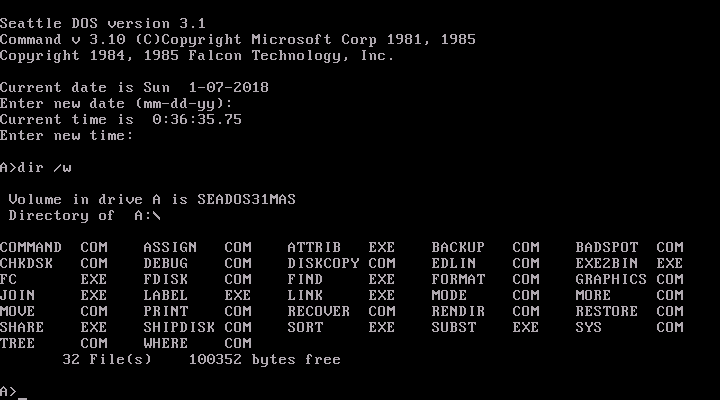 The information in the executables showed it was released by a company called "Falcon Technology". But what is most interesting, Tim Patterson and Falcon Technology were granted a royalty-free license for MS-DOS. I guess that means they could sell copies without paying Microsoft. It sounds like that didn't get them very far, and I don't see that they sold PC clones. In 1986 Falcon Technology was bought by Microsoft to reclaim those royalty-free licenses, and Tim Patterson went back to work for Microsoft. At a glance, this OEM of DOS has a few odd little utilities with it, but it is unclear how much it has been customized, or who customized it. It would be interesting to think that that perhaps Tim Patterson directly added something to this version, or think of it as an indirect continuation of SCP DOS.